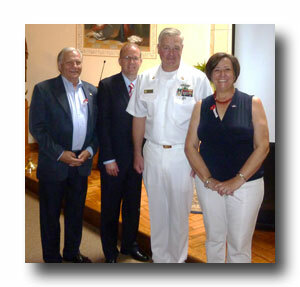 Senator Mensch was honored to attend St. Mary’s 10th Annual Memorial Day Celebration in Schwenksville withPA State Rep. Marcy Toepel and PA State Rep. Tom Quigley. During the ceremony, the legislators joined students in honoring the thousands of men and women who have given their lives in the line of duty. This edition of the Mensch Report features 6th Community Safety Conference which focused on the Heroin Epidemic in Pennsylvania. The event featured Honorable Rea B. Boylan, Court of Common Pleas of Bucks County, Kathy Jo Stence, Chief of the Systems Transformation Projects of the Pennsylvania Department of Drug and Alcohol Programs, and Diane W. Rosati, MA, Executive Director of the Bucks County Drug and Alcohol Commission, Inc. The Center for Disease Control and Prevention reported 8,257 heroin-related deaths in 2013 which was an increase from the 5,925 heroin-related deaths reported in 2012. The Pennsylvania State Coroners Association reported that 2,489 individuals died from drug-related causes in 2014, a 20 percent increase from 2013. In Pennsylvania, legislative and executive branch agencies are working closely on policies and programs addressing education, prevention, treatment, recovery, and law enforcement. The purpose of this CSC was to take closer look at heroin and opioid addiction, specifically treatment and recovery services in Pennsylvania. The panel discussed the Commonwealth’s most current information related to heroin overdoses. In addition, they provided information on rehabilitation services and options available to those battling addiction. They also addressed the avenues and resources available to family members and community organizations that are helping those who need assistance overcoming their dependence on heroin/naloxone. Attendees were also able to share their current action plans and discuss new ideas on how to combat this grave epidemic. The solution starts with each of us, all of us, not just one of us or a few of us. It is time for all of us to join together, fight back and educate each other about the problem. Talk to your loved ones today about the dangers of opioid and heroin use. 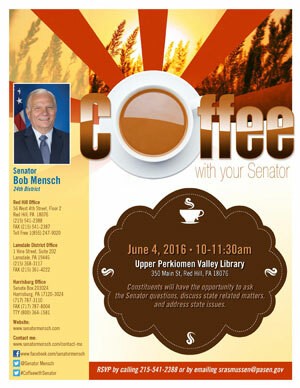 My next Coffee with Your Senator will take place on Saturday, June 4 from 10 a.m. to 11:30 a.m. at the Upper Perkiomen Valley Library. I invite you to stop by, join me for coffee and ask me any state related questions that you may have. RSVP for the event by calling 215-541-2388. Thousands of veterans can receive free dental care on Saturday, June 25, when doctors and their teams from nearly 400 Aspen Dental-branded practices in 33 states open their doors for Aspen Dental’s National Day of Service – an event that is expected to be the largest single-day oral health initiative for veterans in 2016. Like millions of other Americans, veterans can struggle to find oral health care when they need it. That’s why Aspen Dental’s Healthy Mouth Movement, a community-giving initiative launched in 2014, is focusing its efforts on helping veterans get the dental care they need. Interested veterans should call 1-844-AspenHMM to find a participating practice in their community and schedule an appointment in advance – space is limited and appointments are filling up fast! Whether maintaining your property or engaging in recreational and leisure activities, Pennsylvania residents in all 67 counties should be vigilant about preventing exposure to deer ticks and Lyme disease, according to the Pennsylvania Department of Health. 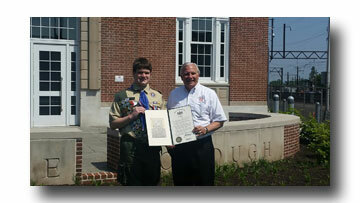 Senator Mensch was honored to attend the Court of Honor ceremony for Peter Jaskiewicz and present him with a well-deserved Eagle Scout citation. Increased transportation funding means more road construction crews along Pennsylvania roadways. Motorists are asked to steer clear of road crews, emergency personnel and law enforcement as they perform their jobs. In 2015, 23 people were killed in work-zone crashes. Additionally, there were 1,935 crashes in work zones last year, an increase from 1,848 crashes in 2014. Over the last five years, there were 9,117 work zone crashes and 105 fatalities in those crashes. Pennsylvania law states that anyone violating the posted speed limit by more than 5 mph will face doubled fines. The fine is determined based on the amount the driver is traveling over the speed limit. A new state law states that any driver who causes serious bodily injury within a work zone can face up to $5,000 in fines and a six-month license suspension. A driver causing a death within a work zone faces up to a $10,000 fine and one-year license suspension. In addition, drivers who don’t turn on their headlights in posted work zones face a $25 fine. During 2016, 39 counties and more than 1,600 stream miles will be subject to aerial spraying to control black flies, also referred to as gnats. The PA Department of Environmental Protection's Bureau of Clean Water, responsible for protecting and preserving PA’s water quality, must monitor and treat, as necessary, more than 1,700 miles of Commonwealth rivers and streams in 47 counties. Spraying with Bti began in April and will continue as DEP deems necessary. Consult DEP’s “Personal Protection” techniques to repel the pest. Contact DEP to discuss any black fly-related issues you are confronting.